Life beyond MKAD. Contrasting life in Moscow and Podmoskovye. What is Zamkadye? What is Zamkadye? Moscow is leaping over MKAD. Moscow is a capital of Russia. It is also a major tourist center and the first city foreigners judge by about the whole country. The impression might be misleading though as Moscow is not the whole Russia and is much different from what Russia is like in fact. It is richer, bigger and closer to the West than any other place in Russia. Russians often say that Russia is sort of is split into two opposite countries: Moscow and Zamkadye (Zamkadie). Let us explain you what Zamkadye is. It is a vast area of Moscow oblast, called Podmoskovye. It borders Tver Oblast in the northwest, Yaroslavl Oblast in the north, Vladimir Oblast in the northeast and east, Ryazan Oblast in the southeast, Tula Oblast in the south, Kaluga Oblast in the southwest and Smolensk Oblast in the west. Podmoskovye is a federal subject of Russia different from the federal city of Moscow that stands in the center. The oblast is highly industrialized, with its main industrial branches being metallurgy, oil refining, and mechanical engineering, food, energy, and chemical industries. Where does the term Zamkadye come from? It was derived from the word MKAD (Moskovskaya Koltsevaya Avtomobilnaya Doroga, or Moscow Automobile Ring Road), a ring road encircling the City of Moscow. MKAD was opened in 1961 because of the growth of traffic in and around Moscow. For a long time the MKAD served as the administrative boundary of Moscow city. Is there a life beyond MKAD? A notorious question "Is there a life beyond MKAD?" has been reflecting the reality of life in Moscow and Podmoskovye region for years and the attitudes of 2 groups of people - Moscow city locals and Podmoskovye inhabitants. The question is sarcastic of course as Podmoskovye is also one of the most densely populated regions in the country. But the life standards are much different. Just a few kilometers beyond the MKAD a way of life unimaginable to the people crowded within the Garden Ring of central Moscow. One can see here shabby wooden houses with outside toilets that neighbor million dollar brick homes hidden behind three meter high walls protected by security cameras. Abundant warehouses, cowsheds and the whole villages can be seen just along the arterial roads of the European part of Russia. Two extremes of society are in striking contrast, which is characteristic to all Russia and reveals the transition of Russia to capitalist way of life. Moscow locals usually show snobbish and even fearful attitude to those living in Podmoskovye and the whole area. In their turn Zamkadye inhabitants generate tons of jokes describing their life and the whole territory as post-apocalyptic land where they live in enclosed fortress, struggle mutants and mining plutonium in own bunkers and moving around either in anti-radiation costumes or tanks. The worsening ecological situation in Moscow city however makes the capital citizens develop a less superficial attitude to Podmoskovye. The growing number of Moscow families move and settle down far from MKAD. Working in Moscow and living in Podmoskovye has become a new life format for many modern Russian families. The capital certainly offers unlimited careers prospects, more chances for professional and personal development. The wages are much higher. While the average annual income in Russia is around 663,435 RUB (20,700 USD), according to 2011/2012 salary survey, average income in Moscow is around 1,150,000 RUB (38,030 USD) Like any hectic megapolis and a cultural capital of Russia Moscow provides more cultural activities, shopping and entertainment, comparatively better medical care and good infrastructure. However the price it takes seems to be too high for many. It is not only about the bad ecology which is Moscow's worst problem, but also high rental costs, terrible noise level, crowds, higher crime rates and unhealthy environment in all ways. Constant traffic jams inside the capital is another big problem. Moscow city citizens spend no less time to get to and from work then those living beyond the ring road and come to work in Moscow. Today life in Podmoskovye is changing. New cottage towns and townhouses, school, nurseries, trade centers and sports facilities are being built, roads improved and rail connection with Moscow is no longer a problem. The real estate prices beyond MKAD remain more affordable than in Moscow, which is the basic factor in favor of Zamkadye for young families. Better ecology, nice nature and healthier environment of Podmoskovye, more space are also the reasons Moscow downshifters target this region as a more comfortable place of living. Russian real estate experts made up the following rating to best Podmoskovye towns: the first 5 are: Odintsovo ( 5 km from MKAD), Krasnogorsk (3 km from Mkad), Lubertsy (3 km from MKAD), Khimki ( 1 km from MKAD), Mytishchi (2 km from MKAD). 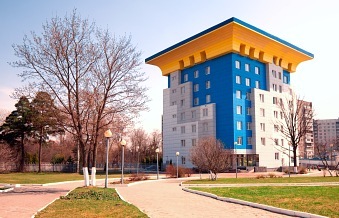 The towns with best ecology are Odintsovo, Korolev, Domodedovo, Klimovsk, Golitsyno and Troitsk. The border has been changing with the time while Moscow has been annexing territories outside of the beltway. The new concept of Moscow development will be the major step done since 1980s. The city territory are planned to be enlarged by 2.4 times - by 160,000 hectares. It is planned to attach to Moscow 21 municipalities, including two city districts, 19 towns and villages and three vacant lands southwest of Moscow. 2, 5 million of Moscow residents are planned to be relocated within the next 30-50 years. New districts for the government (somewhere between Podolsk and Troitsk) and big companies are planned to be built away from the city center. The efforts are made to decrease the number of workplaces inside MKAD by one million while creating 1,5 million workplaces in Podmoskovye. Moscow’s Wall Street, the capital’s International Financial Center - МФЦ - is also going to be somewhere beyond MKAD. A Russian Silicon Valley in Skolkovo is planned to be constructed in the territory of the city settlements of New Ivanovo and Odintsovo. The extreme makeover Moscow city is going to experience would stretch the capital far beyond the MKAD. Russians joke that it will join Moscow with Russia.